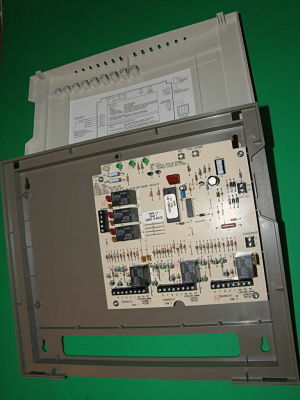 Electronic MiniZone Panel Kit controls single-stage heating and cooling equipment and is used on two and three zone applications. Kit includes C7735A Discharge Air Temperature Sensor and an AT140A Transformer. This feature allows the thermostat to automatically switch from heating to cooling based on the temperature inside. This is useful between seasons when heating may be needed at night and cooling during the day. Technical Specifications: Application: Zoning; Network Zoning: No; Number of Zones: 3 Zone; Heat Pump Compatible: No; Stages: 1 Heat/1 Cool; Auto Changeover: Yes; Voltage: 24 Volt; Discharge Air Temperature Compatible: Yes; Compatible with Supply Air Sensor: No; Resettable Fuse: Yes; Individual Zone Fan Control: Yes; LEDs: Yes.